I knew when I started this challenge that there might be some books I wouldn't get because of cultural differences. Two weeks in and I've come across that first book. 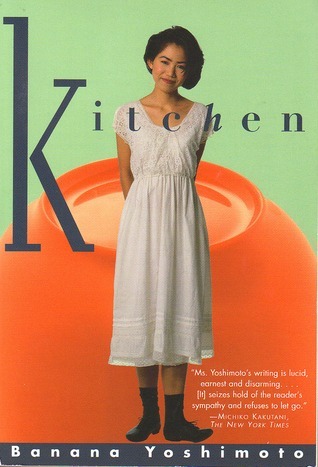 I really wanted to like Kitchen, but it was strange and otherworldly. It was a huge hit in Japan though, so perhaps it's just me. Though the book has one name, it's actually two short stories. The first, Kitchen, tells the story of Mikage. Most people have a favorite room in their house and for Mikage, it's the kitchen. However, it's more than just her favorite room, it's where she feels most comfortable. So when her last living relative dies and she's offered a chance to move in with a classmate and his crossdressing father, she gladly accepts, based on the level of comfort she feels in their kitchen. In the second short, Moonlight Shadow, young Satsuki mourns the loss of her boyfriend. Though she's comforted by the presence of her deceased boyfriend's brother, who dresses in the school uniform of his deceased girlfriend, she longs to see Hitoshi again. An encounter with a stranger on her morning run offers her that opportunity, but only if everything goes according to plan. Both stories dealt with death and crossdressing men. I don't even know what to do with that honestly. I've not read anything else from the author, so I don't know if these are focused on in her other works. It just seems strange that both topics would play such prominent roles within the same book.